SKU: 20P300. Categories: Food, Glass, Honey, Jams/Preserves/Marinades, Jars & Bottles, Sauces/Oils/Dressings. Tags: Chutney, Dressings, Honey, Jam, Marinades, Preserves, Sauces, Sweets. This high quality food grade round panel glass jar is ideal for jam, sauce, chutney, preserve, honey and mustard. It comes with a gold twist off lid and is an ideal jar for artisan products. 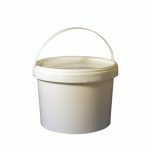 These 300ml jars can be hot filled up to 85° or retorted (filled and cooked). 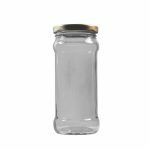 We have an enormous range of glass jars: jam jars, honey jars, chutney jars, and artisan jars. Call us on +353 (01) 450 8759 if you can’t find what you are looking for, we’re bound to have it. The Packaging Centre’s bottles and jars are made from soda-lime-silica (type III) glass, which meets the requirements of the European Pharmacopoeia. 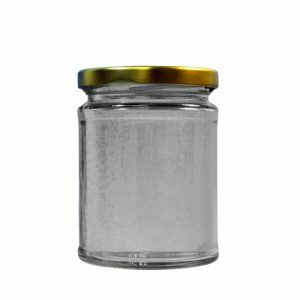 All our glass bottles and jars are produced in accordance with the regulations under the Materials and Articles in Contact with Food regulations. Our glass containers can be recycled and on average contain 60% recycled materials. 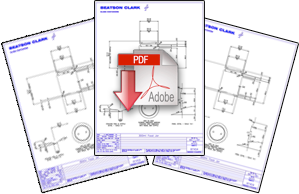 to download the technical sheet.